Montana has come a long way from its wild and rowdy gold rush and pioneering days. In its early stages, the Montana lifestyle was a difficult one, where only the brash and hardy souls would survive, today that has changed dramatically. Modern technology and conveniences have made the new Montana mountain lifestyle not only enjoyable, but enviable. Today's Montana luxury homes provide beautiful expansive interiors with all of the modern conveniences that you would expect from today's upper-end homes. State of the art appliances, integration with your smart devices, the latest green technologies and energy efficiency and more! Many of the homes featured here were carefully crafted and designed to blend into and capitalize on their natural surroundings. Providing unparalleled views of magnificent Montana landscapes, whether it is a picture perfect lake, a blue-ribbon trout stream, or the rugged profile of one of Montana's stately mountain ranges. These homes provide the very finest in craftsmanship, design and modern convenience, and are geared towards those who are not willing to compromise on luxury or an upscale lifestyle. Over 150 Acres of Prime irrigated Farm ground with all the Ranch trimmings. Big barn, shop, outbuildings, corrals, sheds and a home with 7 bedrooms. This is a classic Horse operation.Original parents known for their wagons in parades through out the west.Currently in Alfalfa Hay under center pivot. Property could be purchased with adjoining 4000+ square foot home. Paved driveway, Huge views all located close to many Western Montana activities from Flathead Lake to Snow skiing. A opportunity to be your own boss, Hay farm,Horse Ranch. 'Magical' describes this setting & home on Flathead Lake. Truly one of a kind. Relax while looking onto glistening lake water, with the Swan and Mission Mtns, perfectly framing the sunrises and alpenglow of sunset. It's a backdrop you'll never want to leave. The stunning home was meticulously designed to fit the landscape capturing lake and mountain views from most every window. Spacious guest suite, open entry, inviting living and dining rooms, and five-star master suite all open to your lake front wrap-around deck. Cook and entertain in your gourmet kitchen! Main house also includes library and theater. Your guests will enjoy a fully equipped 2-bedroom guest apt., also with views. While outdoors, sit on the boulders to enjoy the sun or jump in your boat from the protected dock. Are you searching for a special home on the lake with peace, privacy, and views galore? This spacious home, situated on 1.16 acres and no-thru street, awaits. 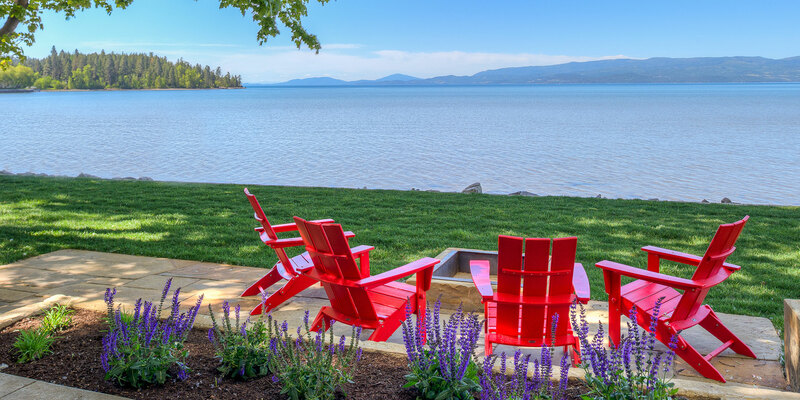 Multiple decks, patios, porches, and terraces offer many beautiful vistas of the Narrows, Flathead Lake, and the Mission Mountains. Home features 4 bedrooms, 3 baths, and huge multi-use open living areas on both levels. Open floor plan on main level makes entertaining easy. Other features include screened-in porch, beautiful rock work, large L-shaped dock, covered boat station w/ power. Home is surrounded by trees and foliage, adding natural beauty and privacy. Call Ric Smith or Sarah Beck at 406 261 0641, or your real estate professional, for a private showing. Hard to come by Shady Lane Bigfork. West side of Swan River with Mountain Views. Hear the river from the deck and inside the home. Your own fishing hole on the river. 8 minute drive to Downtown Bigfork. Enjoy the Flathead Valley, Glacier Park, Whitefish Mountain, Swan Valley, Jewel Basin Hiking. Or simply listen to the river on the deck after a float. 2 room Bunkhouse for guests. Remodeled Kitchen and Master Bedroom and Bathroom. Contact Bret Richmond (406) 210-0230 or your real estate professional. 16 acre victorian farmhouse estate on Stillwater river just outside Whitefish city limits. Immaculate home with 1700 ft of Stillwater river frontage and breathtaking views of the Salish mountains. Parked out property with end of road privacy. New wood flooring, new bathrooms with carerra marble countertops, complete kitchen remodel with quartzite counters, entire home remodeled. Light open floorpan, 4 bedrooms, office, living room, family room, sitting room, large master suite with walk in closet, soaking tub with river views and shower. 2 car attached garage, detached 2 car garage with bonus rooms could be guest house, 36x48 heated shop and additional brand new 36x40 barn, paved driveway, beautiful landscaping. Majestic Swan Range views from this beautiful, custom, spruce log home on 20 level acres bordering USFS. The foyer leads into the great room, fireplace, prow wall of glass, 3 bedroom, 3 bath with a 600 sq. ft. master suite, dual vanities, walk-in closets, exquisite bath & a private balcony. Open kitchen with hickory cabinetry, large cat face logs & river rock island bar. A log stairway leads to an open loft sitting area overlooking the mountains & great room. Alder doors & rough sawn blue pine floors throughout set off this master piece of property. Additionally, a full daylight basement below for recreation or possible bonus rooms. An attached 576 sq. ft. carport. Located on a dead-end road offering privacy. Immense wildlife & recreational opportunities at your beckon. Foys Lake home with meticulous attention to detail throughout! Beautifully designed 4280 square foot home with over 106+ feet of waterfront. Large windows to enjoy the lake views, cathedral ceiling, spacious bedrooms with large closets. Enjoy entertaining on the main level in the kitchen, living room or on the deck overlooking the lake! Entry is gated and paved. Beautifully landscaped and an amazing concrete driveway and private boat launch. This is one of the only private boat launches on Foys Lake! Short drive to Flathead Lake, Glacier National Park and Whitefish Mountain Resort.